Uchikake collection named “National Treasure” which I was attracted most. The theme of the collection is “Momoyama and Keicho period” when a great number of gorgeous architecture was created. 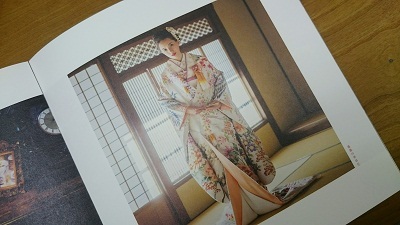 A soft colored Uchikake which makes the bride look very elegant and pretty. 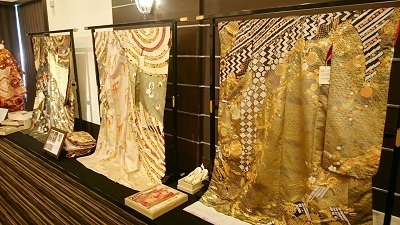 We visited a sales exhibition of “Nijo Maruhachi (=Bridal kimono manufacturer)”. There was an abundant line-up of gorgeous wedding costumes (kimonos). I learned a lot from their style which they adopt the latest trend while they are preserving the tradition. We also would like to plan weddings that our clients can enjoy while respecting the culture and tradition of Kyoto.